Most players must be puzzled with such questions, like which IF is worth investment, how to invest. By the way, trading IF cards is a kind of way to earn coins except the market trading and playing games. So this page will take you to look at some IF trading tips. The IF trading method involves the buying large amount of the certain IF cards, which may be suitable for lazy players and players who have no knowledge of the market, or who don't search for lower price of players. If you know how to do the IF trading method, then here are several things you need know. First, look for things like popular leagues or nations, position changes, lower-rated cards with high stats or anything else that you think will be attractive to buyers. Second, buy large amount of a certain IF and list for a higher price for an hour and relist every hour. You should fill at least one page of the market. Last, once you sell a card, reinvest in another of the same player until you are happy to move on from him. To start, you need to prepare at least 100k, if you don't have, then begin with popular non-IFs and use the same principle this operates on until you reach 100k. As for the price, you should list your card bought for 120-125k, which will give you a profit of 15k on average. Meanwhile, when you are trading, aiming for 50% profit on what you paid is better. It's better to vary your prices slightly as some people will avoid buying a card when they see 13 or 14 at the same price in a row. Change the BIN slightly for each card. 1. Stick to 8-10 cards of the same player. No more no less. Do not put all your eggs in one basket and invest in more than 10 where possible, incase there is an unexpected crash or complication with a player. 2. When you sell a card, replace it with another where possible. 3. Chem Cards and Position changes are not required but may help with a sale. It is suggested to buy fresh cards for attacking players but it is not necessary. 4. Stick to the buy prices you agree on. Buying too high will reduce the profit margins for everyone (including yourself). 5. Trading IF relies on a modicum of luck. 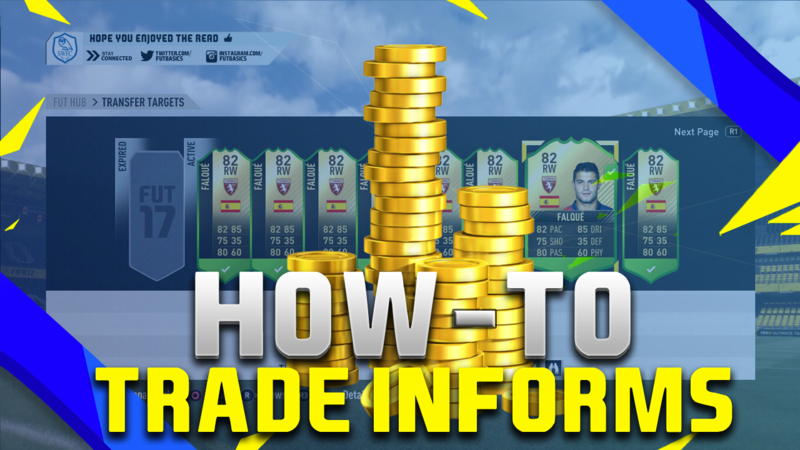 This is not a quick flip method for making coins and does require some patience/faith. So do not start this method if you cannot spare the coins. Sales may come in the first hour, they may require a few days. Typically, trading IF works fine, but for the condition that your cards don't sell, give your cards a month or two and prices will naturally rise to near your higher price. If you bought all fresh, that'll make up the extra few thousand to make your card's once inflated price now become its actual worth. Hope these tips might be a little helpful for you. Remember to be patient. That's important. For the buying price, if you don't have, you can get cheap FIFA 17 coins with enough amount as you wish. When you come across the big promotion, coins are even cheaper.